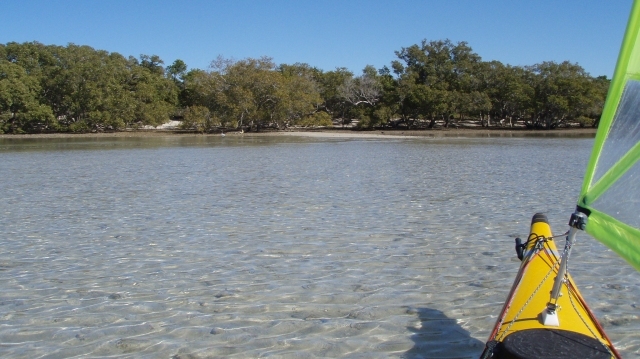 By the the charm of the company encountered on Green Island, it was fortuitous the Camping weekend had morphed into a Sunday paddle. 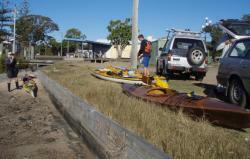 Leaving Wynnum Ck on the low tide it was a muddy launch straight into the channel. A SW breeze made a quick trip over to a scratchy landing on the NE corner of the island. We were greeted by the owners of the three daisy chained kayaks anchored offshore. They were waiting around for a bit more water before returning to Manly Boat Harbour. Morning tea was had to a full bodied version of American Pie and a suite of expletives from people who looked like they had camped over. With plans for being back by lunch we flicked up the sails and headed south to join the yacht race rounding the Lockyer Light before scuttling up the eastern side with a steady S - SW breeze all the way. Mark went right out to the red marker and scooted back on the flood tide in the channel while we dawdled in the shallows. Rounding the top of the island it was straight into a firm westerly. Enough of a work out to whet an appetite. By the rate of service at the fish & chip shop there was a good chance first act of the Mozart Quintet in E Flat for Piano and Winds, K452 had finished at the ABC Studios before Tom had even sampled his calamari.